types2 is a freely available corpus tool for comparing the frequencies of words, types, and hapax legomena across subcorpora. 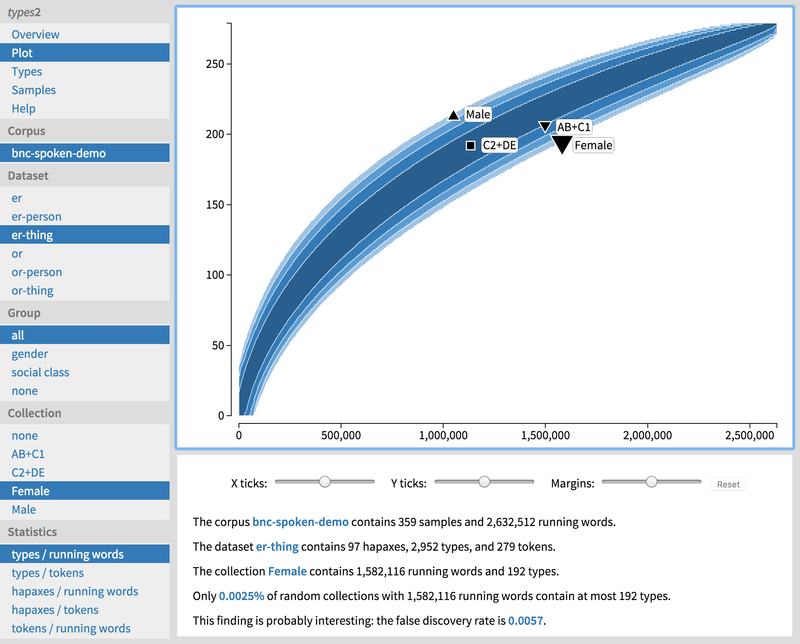 The tool uses accumulation curves and the statistical technique of permutation testing to compare the subcorpora with a “typical” corpus of a similar size, in order to visualize the frequencies and to identify statistically significant findings. The software is written by Jukka Suomela, and the system is designed and developed in collaboration with Tanja Säily. The sample data sets are provided by Tanja Säily. Please see the paper “types2: Exploring word-frequency differences in corpora” for more information on how to use the tool. Tanja Säily and Jukka Suomela (2017): “types2: Exploring word-frequency differences in corpora”. Jukka Suomela and Tanja Säily (2016): “types2: User’s Manual”. -er and -or in BNC. Derived from BNC, the British National Corpus, and MorphoQuantics. -ity and -ness in CEEC. Derived from CEEC, the Corpus of Early English Correspondence. Tanja Säily and Jukka Suomela (2009). “Comparing type counts: The case of women, men and -ity in early English letters.” In Corpus Linguistics: Refinements and Reassessments, edited by Antoinette Renouf and Andrew Kehoe, 87–109. Amsterdam: Rodopi. Tanja Säily and Jukka Suomela (2015). “types2: Exploring word-frequency differences in corpora.” From Data to Evidence: Big Data, Rich Data, Uncharted Data (d2e), Helsinki, Finland, October 2015. Conference presentation. Tanja Säily and Jukka Suomela (2017): “types2: Exploring word-frequency differences in corpora”. In Big and Rich Data in English Corpus Linguistics: Methods and Explorations, edited by Turo Hiltunen, Joseph McVeigh, and Tanja Säily. Helsinki: VARIENG. Tanja Säily (2014). Sociolinguistic Variation in English Derivational Productivity: Studies and Methods in Diachronic Corpus Linguistics. Mémoires de la Société Néophilologique de Helsinki XCIV. Helsinki: Société Néophilologique. PhD thesis. Tanja Säily (2014). “types2: A tool for analysing variation in morphological productivity.” The European Society for the Study of English (ESSE), Košice, Slovakia, August 2014. Conference presentation.